Um, yeah. That big package is 6 pairs worth of yarn and patterns. But who can say no? The other envelope is my gesture at stimulating the Canadian Economy, something from Chicks with Sticks that I can't show you right now. 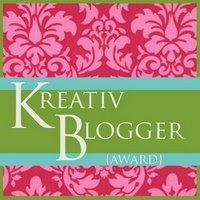 Also, sweet sweet Dana nominated me for a Kreative Blogger Award. Thank you so much!!! Your other so called friends and presumably faithful-to-you blog followers aren't doing you any favors by not chastising you for not sticking to your goals. LOL Thomas! :) Tell me, Jadie, what's Thomas' fix of choice? You're welcome for the blogger award! The socks look excellent! CAUDEC - The "pneumonia meds" drunk state that CAUses Dana to fall down and hit the DECk.